Located in the west end of the gateway town of Callander, the charming Poppies Hotel is just 4 minutes’ walk from the city centre and in close proximity to numerous historical attractions and rambling routes. 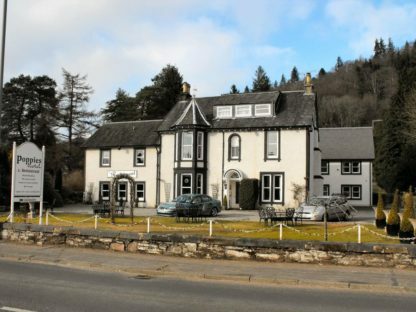 This small, rustic, family-run hotel is located in the Loch Lomond and Trossachs National Park. There are 9 en-suite and individually designed bedrooms, which combine traditional and modern comforts. Some rooms have the facility to accommodate families. Each room includes a TV, tea and coffee making facilities, a hairdryer, and free toiletries. Camerons Bar, the Poppies Hotel’s hand crafted oak gantry has been awarded a place among the top 100 whisky bars in Scotland. It offers a fine selection of malt whisky and guests can enjoy meals in the restaurant, which features fresh local and Scottish produce. The Trossach area is a haven for walking, cycling, and touring. Within the nearby main cities, there are numerous historic places of interest. Stirling is just 20 minutes’ drive from Poppies Hotel and both Glasgow and Edinburgh are within a 65-minute drive.